Can you add to the Database – Is something wrong or missing? - Please let me know. I started my working life at the age of fifteen in 1953, when in March of that year I left school and attended an initiation course at Hucknall Training Centre for 4 weeks then Bestwood Underground Training Centre for a further 12 weeks learning the rudiments of mining before starting work as a haulage hand at Gedling Colliery, Nottinghamshire. 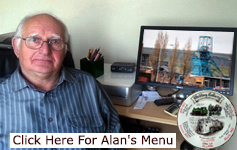 I remained at Gedling for thirty five years until 1988. Most of my career was spent at the coal face as a collier and roadway ripper, becoming a mine official in 1965. For my final 9 years at the colliery I was the branch secretary of the Deputies union NACODS (National Association of Colliery Overmen, Deputies and Shotfirers). After leaving mining I worked for several years at Brewhouse Yard museum in Nottingham. Upon retiring I began to compile the names of fatal accident victims at the Gedling pit. The list of victims expanded to all the mines in Nottinghamshire and the surrounding Counties of Derbyshire, Leicestershire and Yorkshire. The data base of names has grown to over 16,000 fatal accidents in the four Counties, plus the sites of 800 burial places of miners killed, and also the names of more than 4,000 admissions of injured miners to local hospitals. I researched and compiled the names of all the fatal accident victims for the Gedling Miners' Memorial, and assisted in compiling names of fatalities for the Calverton and Bilsthorpe Colliery memorials also. I have submitted the names of over 200 miners in the Hucknall area to a group of dedicated people who are in the process of designing and siting a memorial to the men killed at Hucknall Colliery. Non-Published Books in Selected Libraries in Nottinghamshire. 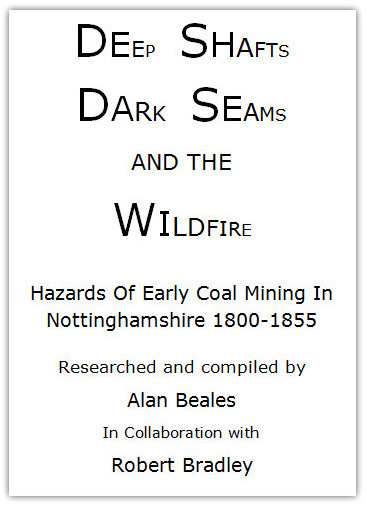 The early coal seams worked in Nottinghamshire were relatively nearer the surface than the larger deeper pits that were developed from the 1850s and later. As the technology of mining advanced allowing the deeper seams to be exploited it also led to the expansion of individual pits with improvements in machinery and equipment, both on the surface and underground. The principal mine owners were Barber Walker Co, Lord Middleton, The Edge family, Butterley Co, John Dodsley, Dr Manson. Oakes Co. and John Coke. The numbers of men working in these pits varied from around 20 to 100 for the smaller operations to over 300 for the Portland pits. The opening of Cinderhill/Babbington led to increased tonnages and a workforce of several hundred men. Most shaft mining was from around the 1800s, earlier deaths, totalling 18 were found in church burial records. The main areas of coal mining were in the following parts of the County. Strelley, Awsworth, Kimberley, Babbington, Cossall, Trowel, Wollaton, Bilborough, Kirkby in Ashfield, Sutton in Ashfield, Brinsley, and Skegby. Shafts were usually between 20 to 100 plus yards deep, the shaft circumference was from 5 feet to ten feet plus, some were brick lined others not. When the ventilation was too sluggish another shaft was sometimes sunk, often the workings of two pits were linked underground. Numerous shafts were sunk in the areas mentioned. When the ventilation current underground became sluggish or stagnant another shaft was sometimes sunk to create an airflow but often the workings of two neighbouring pits were linked underground to accommodate this. Numerous shafts were sunk over several centuries in the areas mentioned. 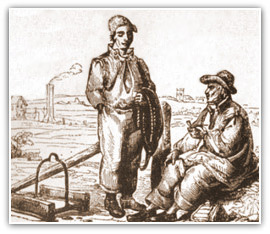 The early coal industry throughout the country was totally unregulated, and both owners and men were learning how to extract the coal profitably whilst minimising deaths and injury where possible. The first time the government became involved was in 1842 when after a series of great loss of life by explosions culminating with the death of a group of young children including some girls by drowning at a pit in Yorkshire in 1840. A Royal Commission overseen by Lord Ashley into child labour in mines reported their findings. Victorian sensibilities were shocked to find that young girls were working underground in many parts of the coalfields, alongside men and boys and often naked to the waist as were their male workmates. Ill treatment of girls and young boys was common and working times of up to fourteen hours per day were also discovered. No female workers were found to be employed in Nottinghamshire and Derbyshire pits at the time although a large number of boys under the age of ten years were working underground. Legislation was passed banning all females and boys under the age of ten from underground work but not on the surface. This was not always adhered to for in November 1849 two young boys Edward Mee aged 14 of Brinsley and William Betts aged 9 from Eastwood were riding the shaft at a Heanor pit when the box tipped and both fell to their deaths. No female workers were found in Nott s and Derby s pits although a large number of boys under the age of ten years were working underground. Legislation was passed banning all females from underground work but not on the surface. Boys under the age of ten were also banned from underground work. This was not always adhered to, in November 1849 two boys Edward Mee 14 of Brinsley and William Betts 9 from Eastwood were riding the shaft at a Heanor pit when the box tipped and both fell to their deaths. Her Majesties Inspectorate of Coal Mines from July 1852 began to collate and publish annual reports into deaths and serious accidents at pits throughout the country. Part of their duties included investigating fatal accidents at pits, but in the early years not every accident was investigated, often a letter to the coroner was deemed sufficient. Whenever there were multiple deaths from accidents the recommendations of the inspectorate were acted upon by the government. The means of entering the workings were by Whim Gins an example is on display at Wollaton Hall industrial museum. 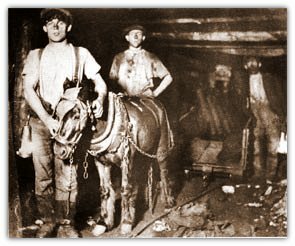 A mounted horizontal drum with the rope leading to a pulley above the shaft was rotated by a horse Men were lowered and raised into the mine by riding the chains. The first ropes were flat hempen ropes with approximately sixty feet of chain attached to the end, each person would have a short piece of chain with a hook at one end a cross piece of wood at the other, the main chain would be pulled to the side by a hook when the person would sit astride the cross piece and put his hook into the main chain, he would then be eased into the shaft. This process would be repeated until six or more persons were on the chain to be lowered or raised into or from the mine. Corves and supplies were attached to the chains likewise. Candles were used by the miners for underground illumination. 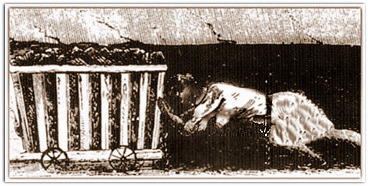 The ventilation of these early mines was quite primitive and many men and boys were burned or killed by the ignition of methane gas normally referred to as firedamp, that had built up in the roof of working places or they were affected by carbon dioxide or blackdamp, a choking gas found near the floor in workings where ventilation was stagnant. The early pits usually had one shaft, two became normal much later, and two shafts by law only after the Hartley colliery disaster of 1862. Roadways were usually the seam height. Initially the coal was placed on wooden sledges and dragged by boys to the shaft side, where it was loaded into wicker baskets or corves. The boys wore a belt with a chain attachment that passed between their legs and fastened to the sledge. As the workings extended further from the pit bottom this became impractical, the sledges were replaced by wooden tubs that ran on wooden or metal rails, donkeys/asses or small horses pulled these tubs. These unfortunate creatures were blindfolded rolled on their backs their legs tied together and they were lowered into the mine the same way as the men fastened to the chain. Stabling was made for them in the pit bottom area. The next time they left the mine they were usually dead. Their whole lives underground was mostly in total darkness, those that were not killed in accidents or died from other causes eventually went blind. The pit top was open and fencing of shafts minimal. Later boxes were also used to transport men and coal, cages were a later innovation, and the first steam engines came into use about the 1820s. In the villages were the miners lived there were no hospitals, only the local doctor for medical treatment. I assume dead and seriously injured men were got out of the pit the same way unless the dead were tied to the chain. The dead or injured man would be taken to his home in a cart or by other means. The body of the deceased would be taken to the place of inquest for the jury to see, usually a public house or somewhere appropriate for the Coroner. Inquests were usually held within a few days of death occasionally the same day. Coroners even held inquests on Sundays. A large proportion of deaths were by falling down the shaft or by ignition of methane. From 1800 onwards as more mines opened the death rate increased, the first double fatality occurred in 1800, from that date until 1855, 200 plus men and boys had perished. Until 1846, the Coroner had a power dating from medieval times of imposing a Deodand at an inquest. If an animal or object had been the cause of a person s death they could be forfeited to the church or the Crown and sold, the proceeds going to charity. By the 1800s instead of a forfeit the coroner imposed a monetary payment. There are three instances on record where this was imposed on a pit fatality in Nott s. The inquest was held as near as possible to the home of the deceased, a room in a public house the usual venue, or other appropriate premises, the body would be on view to the jury, usually of three or four local men. Occasionally more than one inquest was held on the same day. The mines inspector was required to give evidence at the inquest which could be adjourned until he was able to attend; sometimes he did not examine the scene of the accident but forwarded a letter to the Coroner saying in his opinion death was accidental. There was no compensation paid in this period the first Employers liability act was passed in 1880, the Workman s Compensation act in 1897, families would be left destitute and many were forced to apply for parish relief, i.e. the workhouse. A Coroner s jury were paid a small fee for their services and occasionally they donated this fee to the widow to help with the funeral costs. The demand for coal grew from around 1800 onwards, the canal waterways, crisscrossing the countryside had enabled coal to be delivered to central points for distribution. Gang Wagons that ran on rails and pulled by horses augmented the movement of coal. It would be over forty years for the rail lines to be laid that led to the second expansion of mining and larger collieries. Most of the villages and hamlets that supplied the workforce for this growing industry had previously depended on agriculture and framework knitting for its main employment. Most of the pits operated within a ten mile radius of the town of Eastwood and the men employed had to learn of the dangers and problems of working deeper pits.